The past weeks haven’t been exactly good to me. But that’s not reason to ignore the little happy things that kept me going. 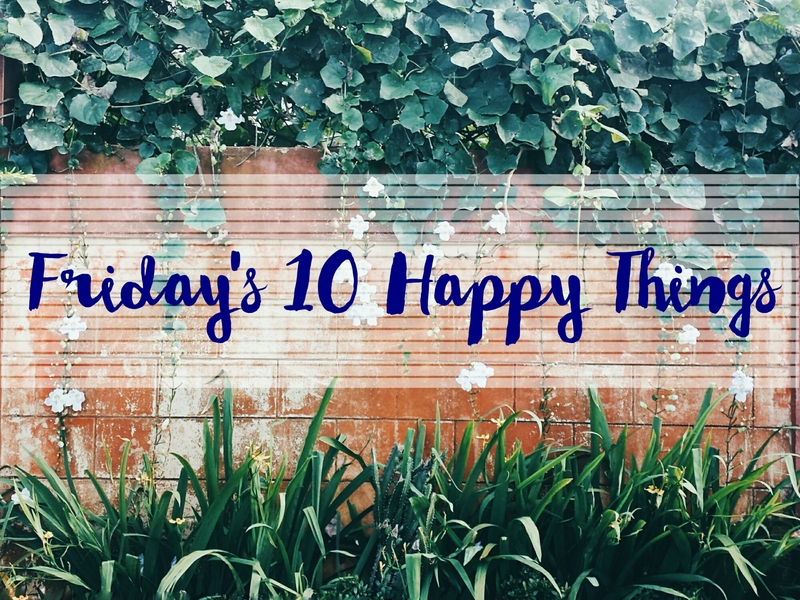 Friday’s 10 Happy Things is a blog link up started by one of my favorite bloggers, Helga. The mechanics are pretty simple (but not necessarily easy): Every Friday, write down ten things that made you happy that week. I used to do something similar to this, the Happy365 — I actually had a small notebook where I wrote all the things that made me happy, EVERYDAY. I think I stopped when I moved to my current job and got incredibly busy. Although work has been a biatch, learning new stuff is actually fun, like Python and SQL Alchemy and Object Oriented Concepts. Maybelline White Super Fresh + Happy Skin’s lip and cheek mousse + Evian face mist. The heat has kept me from my usual makeup routine, but these hardworking babies have kept me fresh-faced, seemingly blooming and shine-free. Sanji’s huuuge appetite. And I mean huge! He eats almost anything that we give him — he especially likes steamed chicken and even says “mmm” and “chap” when we feed him. My boss’ patience with me. I keep bugging him to guide me through object oriented programming because I’m not very comfortable with it. I appreciate that he doesn’t make me feel more stupid than I already feel I am. My new Rusty Lopez boots that didn’t need breaking in. I have worn them twice already, and they’re super comfortable and so easy to pair with most of my clothes. Getting back into blogging again, after weeks of silence. Finally getting rid of the zit INSIDE my nose. I get those every summer, I guess because of the heat? And I’m telling you, a zit inside the nose is paaaiiinful! So painful that I took two mefenamics for two straight days because the pain was radiating through my whole head. Boy am I super relieved that that’s over! Tomorrowland movie night c/o free tickets from our office! My girl friends and I were finally able to meet over coffee and talk about feeling old and #Tita! Yay for blogging again! I’m also starting to blog again after last year’s long hiatus 🙂 Hiiii! I failed really bad during the beautycon that I have to punish myself this coming month! It really isn’t that easy to think of 10 things that made you happy! Haha, I struggle sometimes, even though I start my list as early as Monday and try to add 2 each day. I have a bottle of the Evian mist somewhere but I never ever used it. I wonder if I can find it and if it’s still any good. HATE THIS HEAT.